As some of you may know, the last couple of weeks have been quite exciting for technology and fashion. While big hardware manufacturing companies were showcasing the latest mobile devices, tablets and gadgets at IFA 2012 and event all over the world, fashion designers have been deep diving into the Fashion Week events in New York, London and soon Paris. In the last couple of years I have noticed an increasing interest from fashion designers and brands to bring more engaging experiences to consumers on their retail spaces and high end events. However, 2012 is pushing the expectations of what fashion and technology can do together. My wife is an independent fashion designer, stylist and blogger who has been keeping an eye and reporting the latest trends to the community through her blog (if you like her blog, you can also follow her on Twitter). In the last couple of weeks we have been discussing the increasing usage of technology in fashion retail experiences, and beyond that, the use of cutting-edge technology in events like the London Fashion Week. I believe this is quite relevant for the technology industry, because through fashion, technology can reach a whole different target segment, including non-tech-savvy people which might not otherwise have any contact with some of the bleeding edge technology hitting the fashion stores. People is already loosing the fear to touch and play with technology. Smartphones and tablets are improving people’s relationship with technology, and public spaces mixing digital with traditional experiences will have a deep impact in people’s perception. 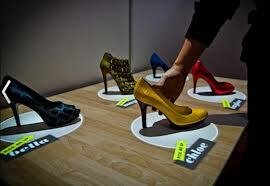 Take for example Perch Interactive Footwear display system which turns a normal surface into an interactive display through the usage of cameras, motion sensors, lights and image projections. 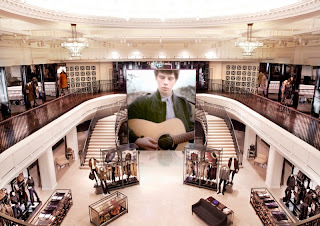 Another good example is Topshop’s retail efforts to personalize and provide a premium experience for their clients. Mirror Mirror is a retail installation that puts clients in front of an interactive mirror with real time feedback from fashion designers around the world with access to the installation cameras, giving users designer’s feedback and advise right on the spot. 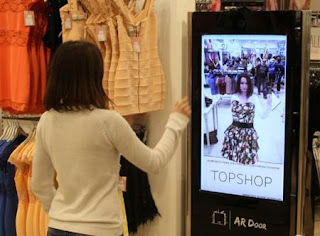 Topshop also created an Interactive Fitting Room installation powered by Microsoft’s Kinect Sensor which provides users with an augmented reality experience on their store. Fitnect did a similar Virtual Fitting Room experience using gesture controlled interfaces (also known as Natural User Interfaces or NUIs). 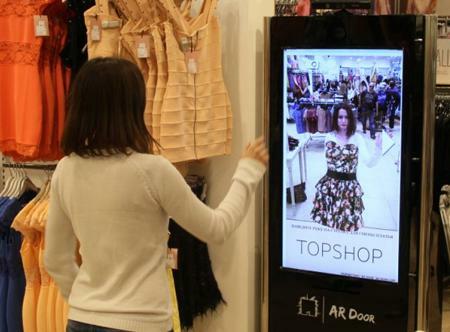 Although you might be opinionated about virtual fitting room’s success, the reality is that these kind of installations expose people to high end technology in a seamless way. 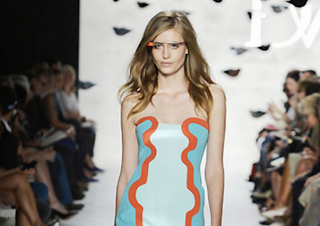 Google’s augmented reality Project Glass, which although in its early development stages, is causing a big fuzz in the fashion industry by teaming up with designer Diane von Furstenberg. By using bleeding-edge technology and a very well executed marketing campaign, people is able to experience the fashion’s couture back stage experience like never before, and even if this is just a small part of the technical implications and objectives of the Glass project, it is exposing people to technical terms like Augmented Reality, Heads-up Displays, Natural User Interfaces and large scale video sharing. All these is actually really healthy for the technical and digital industry cause it puts all these terms into the general public’s heads. There are many more examples happening all over the world. Some of them could be seem as lame or useless, but others are quite impressive. The latest technologies, like NFC, RFID, Gestures and Facial Recognition, wireless charging and sharing, and many more are being embedded in retail and public spaces like Burberry's London flagship store, digital interactive applications, online experiences with cutting edge social sharing and even wearable clothing. Now, as I was saying think about the implications for the general public. All these efforts are getting people closer to new technologies, not just old, mass technologies, but actually cutting edge, still-in-development technologies. This is good in many ways, and pushes people’s expectations and boundaries, forcing companies and brands to use digital in smarter and more engaging ways. I final example I wanted to mention is the upcoming (actually in a couple of hours) Topshop interactive online event, which will allow people to customize the London Fashion Live Stream Show by personalizing the stream and providing a social and online shopping real time experience. If you are interested, make sure to tune in Topshop.com today, Sunday, September 16th, at 3:00pm GMT on your favourite Browser. I actually liked reading your writing content. It was a quality material. I recommend you to submit blogposts even more frequently. This way,with this kind of a blog I think you might rank higher in the search engines. I also subscribed to your RSS feed. Continue this great work!